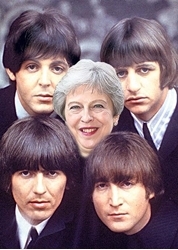 Theresa May reveals her favourite band is The Beatles . Beatles Radio: The Beatles, Solos, Covers, Birthdays, News The Fab 4 and More! THERESA May has revealed her secret favourite band — The Beatles. She also admitted she is a fan of the late Whitney Houston. The PM confided her musical tastes to pianist Davide Foroni at a five star Italian hotel on her walking holiday last week. It came after she led guests in a stirring rendition of the national anthem which he played on the piano. Davide told The Sun on Sunday: “Mrs May came and thanked me and we discussed her musical tastes. "She likes everything from classical to contemporary and jazz.